Things to do in Freiburg Germany - Make your trip unforgettable! When we lived in Basel, Freiburg was always one of our favourite cities to visit on a weekend. There are so many awesome things to do in Freiburg and the whole place has a very relaxed vibe, especially in summer. Freiburg im Breisgau is a city in the German state of Baden-Württemberg in the south of Germany. The town was founded in 1120 as a free market town. The city has a population of about 220’000 and is mainly known for its medieval minster and the Renaissance University. The city serves as an entrance to the Black Forest region of Germany. Freiburg city is conveniently close to Basel, our hometown. Because of this, we loved to go there on a day trip every now and then. The Basel to Freiburg train takes between 30 and 90 minutes, depending on which service you take. The old town of Freiburg is very romantic. Most noteworthy are all the artificially created and water-filled channels (Bächle) running along the streets. We’d love to show you some ideas for what to do in Freiburg and how to spend an awesome day in this pretty city. The Freiburger Münster in Germany is one of the main Freiburg attractions. The majestic cathedral took more than 300 years to build and yet it is the only gothic church in Germany which was finished in the Middle Ages (1330). The Swiss historian Jacob Burckhardt described the 116 meters high west tower as “the most beautiful spire on earth”. The impressive pillars and the robust walls serve as a symbol for the connection to the earth and the stunning spire as a connection to the heaven. It was the first time that a cathedral, which was built in a gothic style, had a spire built in an open lattice structure. This made the Freiburg Munster a model for many European cathedrals to come. It is a wonder that the cathedral actually still stands! The whole west side and north side of the market was completely bombed during the World War II. Yet nothing at all happened to the magnificent cathedral. One of our favourite Freiburg things to do, especially when it is really hot outside, is to dip our feet into the refreshing water of the cute little “Bächle”. The Dreisam River keeps these small canals filled with water. They once served as a water supply, particularly for fighting fires. Today tourists and children alike love the Bächle and appreciate them as a welcome source of refreshment for hot feet in summer. The bächle are even awesome in bad weather! There is even a “Bächle” boat race for kids in Summer. All kids are invited to join. They can either bring their own boat or buy one there. It is organised by the REHA-Verein Freiburg e.V. and held in the Münsterstrasse in Freiburg during July. The boat race in the “Bächle” is fun for young and old! By the way, legend says, that if you are single and accidentally fall in one of the “Bächle” in Freiburg, you’ll have to marry a Freiburger. One of the things we really love about Freiburg Germany is the many cobblestone mosaics you can find on the ground in Freiburg Old Town. They originated with the paver Alois Krems who lived in Freiburg around 1858. He was inspired by some paving he’d seen in Southern France. In the late 19th century all the gutters had to be relocated from the middle of the street to the edges and several roads were repaved with cobblestones. Krems used this event to build mosaic decorations and mosaic writings of when those streets were built. When the Old Town of Freiburg was turned into a pedestrian zone in the 70’s, the cobblestone mosaic had a revival and the streets were newly decorated with mosaics. These days you can find a variety of different mosaic symbols in Freiburg. Some of them indicate what you’ll find in the building behind the mosaic (for example scissors for a hairdresser). Others show important dates (like when a house was built). Furthermore, some have a purely aesthetic purpose. If you’re in Freiburg and you wonder what the single mosaic mean, you can check out this page in German which shows the meanings of the single mosaics. For us, the cobblestone mosaics are definitely one of the coolest things to see in Freiburg. Our favourite mosaic in Freiburg! The local newspaper of Freiburg was once printed in the Markthalle. Today, this place is all about food. There are 22 regional and international food stalls collected in this market hall, including exotic cuisines like Iranian and Chinese, alongside more local dishes. With such a diversity of delicious food, the Markthalle is our absolute favourite place to grab lunch or dinner whenever we visit Freiburg and need a break from our Freiburg sightseeing. The prices are decent and the quality of the food is really good! One of the many delicious dishes you can get in the Markthalle in Freiburg. On the webpage of the Markthalle Freiburg, you can find all the stalls and opening hours. Freiburg, especially in summer, has a quite romantic flair. The buildings along the streets have beautiful facades and are rather colourful. The “Bächle” add a lot to the cities charm and there are some cosy cafes with outside sitting areas where you can enjoy a good coffee or a refreshing cold beer (we are big fans of German beer!). Let us give you some impressions with the following photos we took in the Freiburg city centre. If you are in Freiburg for more than 1-2 days, have already done all the things to do in Freiburg Germany and you love theme parks, then you should definitely think about a visit to the Europa-Park in Rust. It is Germany’s largest theme park and the second most popular theme park in Europe after Disney Land Paris. Visiting the Europa-Park is in Tom’s opinion probably one of the best Freiburg day trips you can do if you like some action and entertainment. The whole theme park is divided into different areas, each of them assigned to a European region. So you can for example ride on a rollercoaster which is inspired by Swiss bob-sledges or do Fjord-Rafting in the Scandinavian part of the park. You love theme parks but hate queuing? Then check out this amazing offer for a Europa-Park Entrance Ticket with Fast Cash Lane Access! If you want to stay longer than just one day, you can even stay in one of the themed hotels overnight, like for example in the 4 Star Hotel Colosseo, which is a unique copy of the Colosseum. 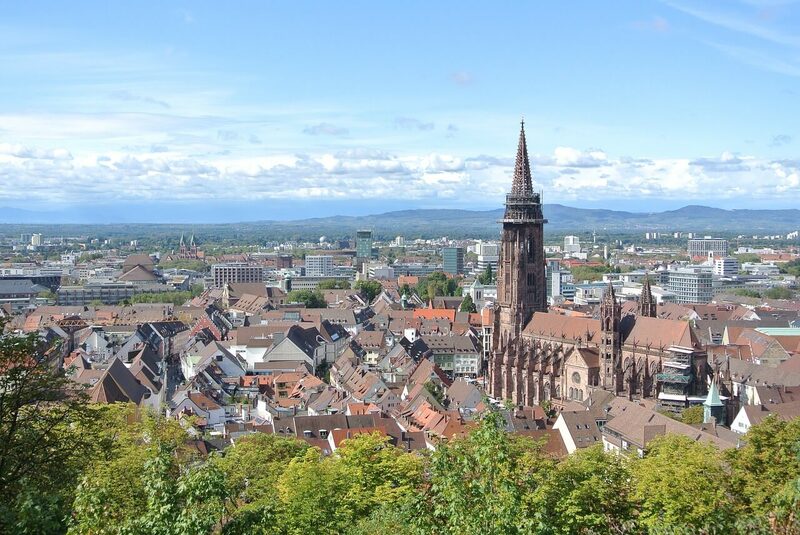 We really loved to visit Freiburg im Breisgau during the time we lived in Basel. The romantic air of the old town with its cobblestone mosaics and “Bächle”, the delicious and cheap food in the Markthalle and the magnificent minster make this city a worthwhile destination when you are in the south of Germany or the north of Switzerland. The best time to visit is from late spring to early autumn. With the warm temperatures, you can properly enjoy the cool water of the “Bächle” and sit outside while enjoying a drink. Looking for more things to do in Europe? Then check out our other Europe posts! If you want to stay longer than a day, then you can check booking.com to find the best Freiburg im Breisgau hotel.